Our crack staff takes a look at the results of the Government Sequester. Claiming to save large sums of money spent of projects that would provide jobs and income to the nation, elected officials have managed to put the most industrialized country in the world on hold. It’s not only kept people from finding employment repairing our dilapidated road system, including bridges near collapse and archaic railways and landing strips, but it’s kept the people who would be at these new jobs from spending money at other businesses, improving their living situations. Now, due to budget cuts, those who have jobs and are attempting to safely go to work are driving on unsafe highways. 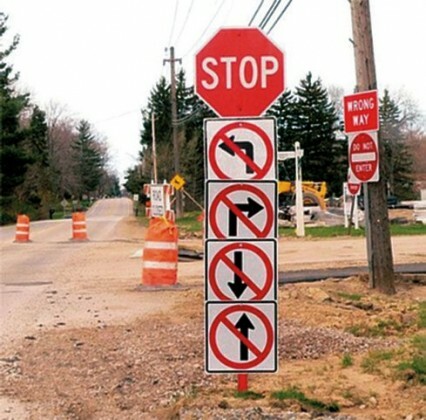 These signs of our times reflect the fact that many people have nowhere to turn. Imagine you were unemployed or underemployed and you came to this intersection at the corner of Gridlock and Apathy. Watch Your Step . . .